Ducktails is a one man instrumental island-psych by Matt Mondanile, and was the name of a cartoon my friends younger brother would torture us singing the theme song. 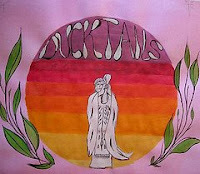 I just got this Ducktails 7" in the mail a little while ago and have been putting it on here and there the past week. This long 33 player is definitely home recorded. I can just hear that cassette quality...it's a little muted, all the high end stripped away. It sounds like it's bounced down to two tracks and then recorded over and over...that's the best sound. It's a little like Basinski's Disintegration Loops. You can hear it in the process of degrading, it kind of gives it a timeless, other world quality. Just like Ariel Pink...it's so unique sounding...there is almost no easy way to fake this, there's no filters that would let you just get away without actually going through the work. Stronger parts have to be reinforced, mutated...or just completely re-recorded to get it to come together in a way that subtracts as much as it add's. It's a weird fight to make it through. Everything I've been reading about this attaches a 'tropical' feel to this, and I don't think it's just because I've been reading that...it really does. I've been trying to figure it out...like a low-fi hawaiian movie set. Or a fake luau set on a roof in Brooklyn....or Massachusetts, which is where this was recorded actually and really doesn't make sense, the snow, the new england rocks, the college's...especially the track, Point Pleasant Beach...maybe it's the title that's sending everyone in this direction? Whatever it is, it fits. Do we have to even talk about low-fi anymore? Let's just call this anti-studio. There's a reason other than financial not to rehearse compositions forever and just beat them to death for the hundredth time in a huge multi-track studio. Sometimes in the middle of the night something takes over and you play that one loop over and over until you're hypnotized and guitar melodies just happen that surprise even you, playing them back. It's imperfection at it's finest, it's sloppy, off key and all, like the best documentaries...from the 50's...about something you really know nothing about. Like that documentary 'Nanook of the North' about Eskimo's from the 30's. It's a document of an idea, wrong or right...it becomes something new. Here's a way better review from Visitations Music. There are only 300 and are still available from Breaking World Records.